This past Saturday after a relaxing day walking around the West Village Mr. T and I headed to the new Rye House on 17th street for dinner. It was still pretty early but the bar up front was packed. We got seated at the long communal table in the back where it was relatively quiet. We ordered up some beers and the waitress brought over a basket of Boiled Peanuts- compliments of the chef. Okay I’ll be honest. I am a peanut lover but I thought these things were disgusting. I mean why would you boil peanuts? It took all of the flavor and crunch out of the nut and made it sad and smelly. Maybe it’s just me but I would give people something really good to start as a complimentary appetizer. For our real appetizer we decided to split the Sloppy Joe sliders. I don’t know about you but neither of us have had sloppy joe’s since high school days. My mom used to make them at least once a month and somehow I forgot about that staple of my diet growing up. Luckily I am right back on board. 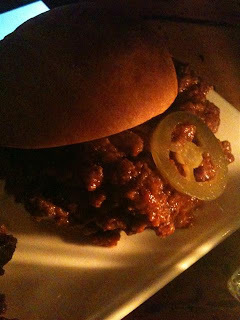 These sloppy joes were delicious. Made with kobe beef and pickled jalapeños these sliders were little bites of spicy goodness. 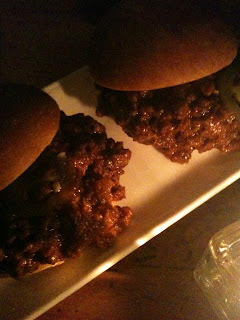 They were so delicious in fact, Mr. T and I made a pact to make sloppy joes at home next week and come back for these sliders again. For my main course I ordered the Shrimp Roll. Look at how big those pieces of shrimp were! 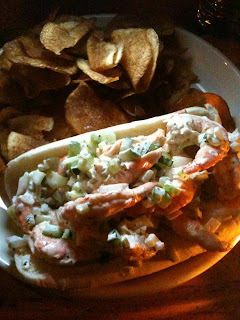 They mixed the seafood with some mayo, chopped up cucumbers and cornichon. The cornichon gave it a slightly sour flavor that was actually quite nice. I ended up crushing up some of the fantastic potato chips into the roll just for a little extra salty crunch. Mr. T ordered the Pittsburgh. This sandwich is styled after the Primanti Brothers restaurant in Pittsburgh. 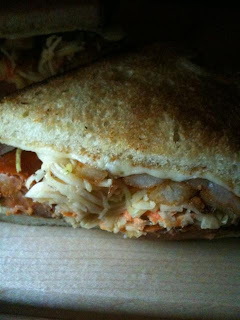 Each sandwich there comes topped with the same ingredients- French fries, coleslaw and tomato. Here the main ingredient was andouille sausage but the fixings were just the same. This sandwich was strangely perfect with everything together. I thought it was going to be this monstrosity of a sandwich but they actually made it with the perfect amount of filling so the sausage and fixings worked together. This was a very satisfying sandwich. Mr. T and I licked the plates clean basically. The best part was about to come- the check. For all of this food plus two microbrews it came to just around $45.00. That is quite a cheap meal for NYC. I really enjoyed Rye House. Hopefully it will continue to serve up food as good as this with the low prices. It’s a real welcome addition to our neighborhood.